For the latest edition of Bike Life, I thought I'd write about Sustainable Produce Urban Delivery, aka SPUD. I've been a customer of SPUD for well over a decade, getting a Rubbermaid bin of fresh organic fruit, veggies & other groceries delivered to my door weekly. Now, you're probably wondering, why is a grocery delivery company being featured on Bike Life? Because they do some of their deliveries by bike. Or, rather trike. 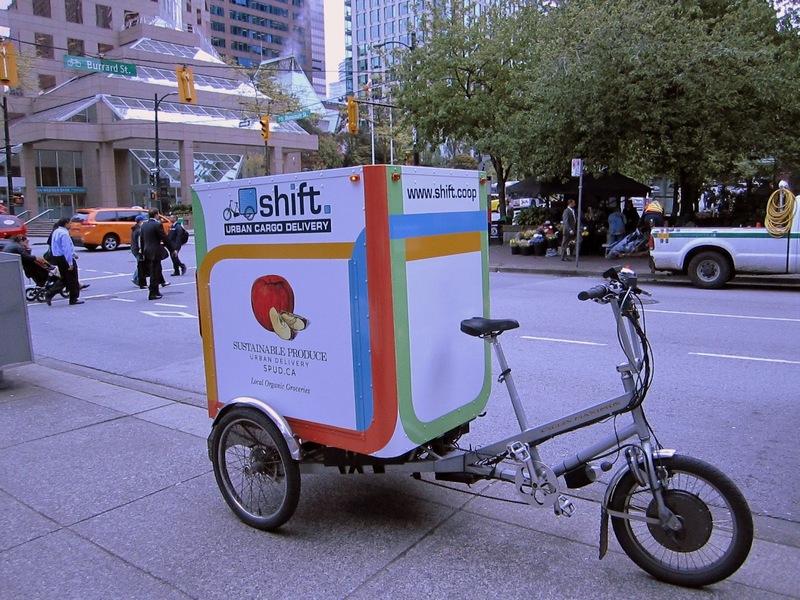 After contacting SPUD about doing an interview, I got to meet Corbin Bourree, Director of Business Development, as well as Robyn Ashwell, Co-owner of Shift Delivery Co-op, who is also one of their intrepid delivery trikers. Robyn trikes part time for Shift, about 15-20 hours a week, on top of her other duties with Shift. SPUD has been doing bike delivery with a trailer for years--that's the rig they use in Victoria currently--but has been working with Shift Delivery Co-op for almost a year now. Shift runs custom-built cargo trikes (more detail on Shift & their tricycles in a future Bike Life feature...) to deliver SPUD's boxes & bins on a number of their routes serving business customers in the downtown core. 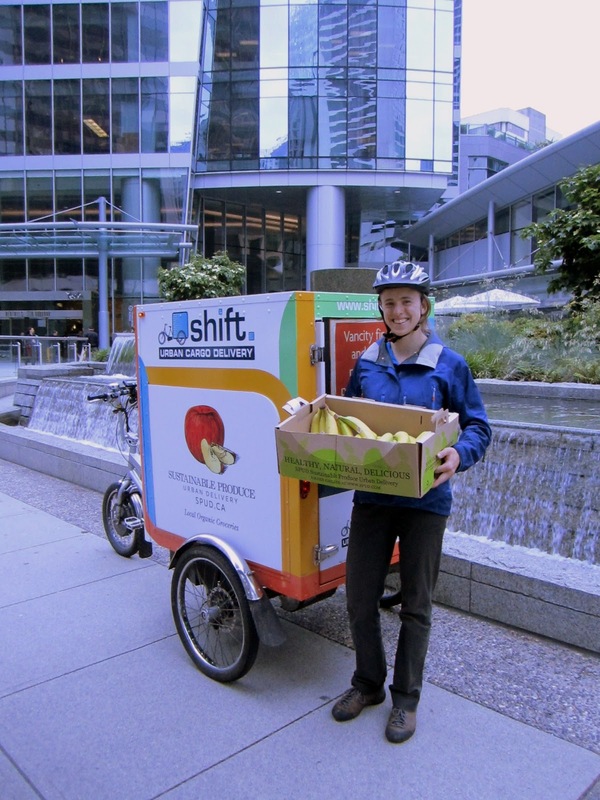 Each Monday, two of Shift's trikers deliver about 70 boxes of fresh produce & groceries. You might be wondering why bike delivery? Of course it's greener than driving a truck, but isn't it slower or less efficient? When I asked Corbin this question, he told me that SPUD has found it to be about 20-30% more efficient in the downtown core than delivery by truck, for a few reasons. It's faster for a trike to zip through the bike routes downtown, past the traffic. Parking is never a problem because the trikes don't need to find an available spot in a loading zone--they can pull up on the curb. The trikers don't need to wait for the freight elevators either--they just hop off the trikes & bring the boxes up to the buildings in the regular elevators. When talking about the efficiency, Robyn added, "We thought it would be more efficient before we started, but proving it has been really exciting!" Trike delivery downtown is going so well that SPUD is planning to expand the service later this summer. When I asked Robyn if she finds that she needs to eat a lot more when she's biking this much, she replied, "For sure!" Robyn gets around most of the time on her Devinci Stockholm commuter bike, which she uses to get to & from work at Shift, as well as bike tours & pretty much everywhere she needs to go. Well, except for the Bowron Lakes circuit, which she recently did by canoe. When asked what the best thing about biking for a living is, Robyn replies immediately, "Being outside! When I bring deliveries into the offices, sometimes people are sitting there in windowless rooms & they ask me what the weather's like." The downside of biking for a living is what you might expect here in Raincouver. "It can be hard to get up in the morning on a really rainy gross day, but once I'm on the trike it's okay. I also don't like the occasional negative interactions, because I'm trying really hard not to get in people's way." She says it's frustrating when drivers are rude, & that it can be hard to just take a deep breath & continue on. The vast majority of people respond positively to SPUD's three-wheeled delivery, however. Robyn tells me that she always keeps her helmet on when she goes up into the office buildings to make her deliveries & it gets her some double-takes. When she explains, that yes, she delivers food by trike, people respond with, "That's so cool!" and "Love the idea!" Corbin mentions that SPUD gets lots of emails & calls from people who've seen SPUD's logo on the sides of the Shift delivery trikes or talked with Shift's trikers. "All the feedback is excellent. Shift trikers have been great ambassadors for SPUD." you'll save $25 on your first four deliveries. "In 1997, SPUD.CA was founded based on the idea that there was a better, more sustainable way to buy groceries. Not only was there an opportunity to directly connect communities with local farmers and food producers, ordering food online and using a just-in-time home delivery system meant a better product and convenience for customers. When you purchase local food, you are involved in an important movement that contributes to your local economy, improves food security, reduces your environmental impact and provides more nutrient rich foods. SPUD.CA serves and supports 6 urban areas in North America. 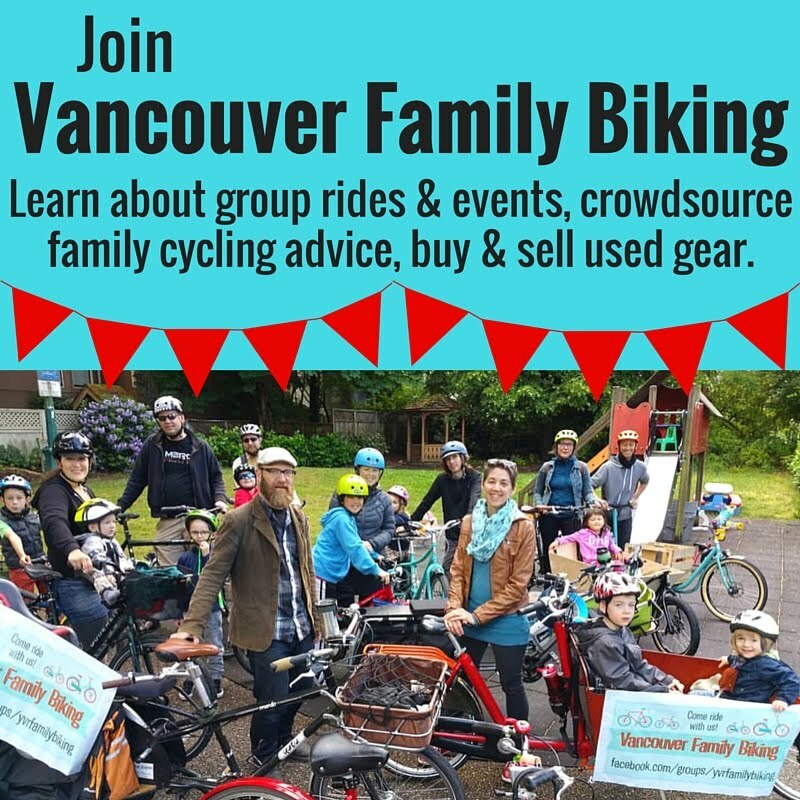 These great communities include Greater Vancouver, Victoria & Southern Vancouver Island, Calgary, Seattle & the Eastern Puget Sound, the San Francisco Bay Area, and Los Angeles & Orange County." SPUD is a great service to have and it's rad that it's local. I've seen Shift trikes around too, also rad. Wow I would have assumed that the bike delivery would be slower and less efficient. Great to hear that in addition to clearly being better for the environment that the bike also is faster and more efficient. The SPUD bike pioneer was Rusl who toiled with a huge 500# trailer full of bins. Up and down the hills of East Van.